I never imagined I would eat a cooked apple until my time in Germany proved me wrong. It started with Apple pie, and thereafter nothing could stop me. Next thing I know, I was experimenting with baking apples, as well as other fruits. But then again, I never thought I would be making savory dishes with apples, until recently. Oh Yeah! 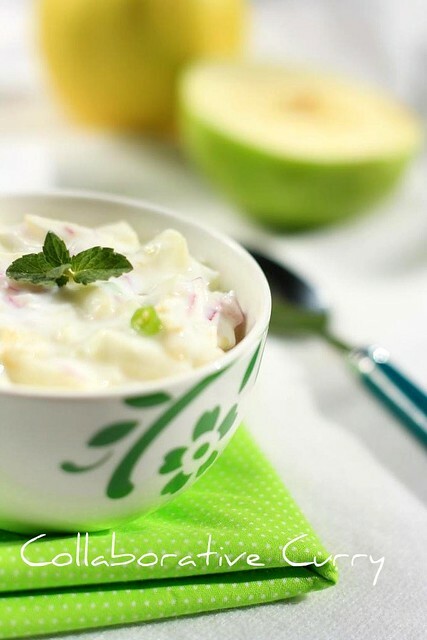 I made this simple raita for lunch and everyone, including my toddler loved it. It's tangy and delicious. Very simple to make - refreshing and tasty! 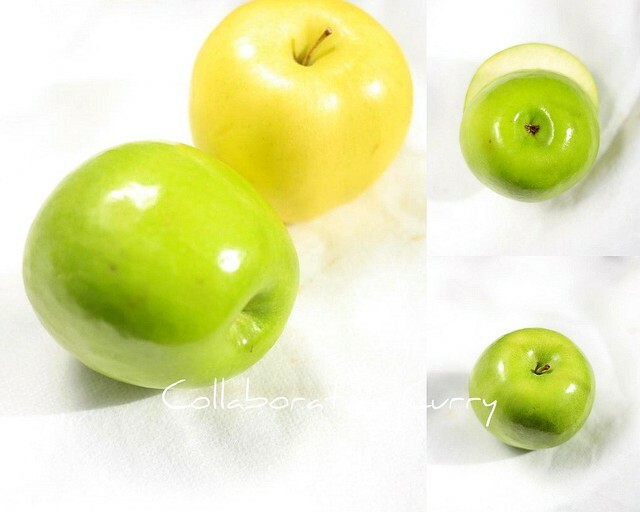 Two kinds of Green apples, for comparison,the Golden delicious is so sweet and the Granny Smith is tart and perfect for baking. 1.Finely chop the apple into small pieces. 2.Finely chop the green chillies too. 3.Whisk the yogurt in a mixing bowl. 4.Add the salt and other ingredients except lemon juice and mix well. 5.Chill,mix in the lime juice, garnish and serve. This is such a great and healthy idea with apples. Oru rakshayum illa chech!!! adipoli!! 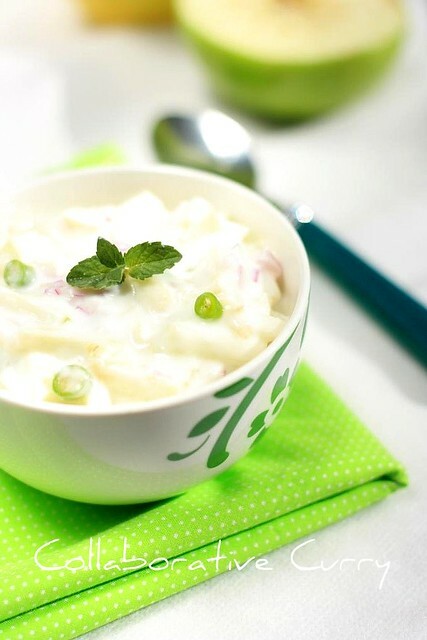 Thats a fabulous raita, looks absolutely yummy.. Very nice! Question for you -- Does the apple change color? I see that you use lime juice but for how long before it starts changing color? Curious! Me loves apples in Raitha..I add them all the time... Slurpp... And regarding CL's question : apples doesn't change color if I cut and add them immediately in yogurt/curds. This is what I have observed. Ethu kollamallo, Nami..Great idea!! Ennelum try cheythu nokkunundu..
Apple Raita is adipoli. Healthy one. Perfect to go with any curry! Wow great innovation and looks so tempting namitha. Too good clicks!!! Delicious raita too!! That's innovative and looks very inviting too.Long time I heard from u dear, how r u? Thats amazingly innovative and a yummy raitha. Raita looks awesome. So tangy and mouthwatering. Wow I too make this once in a while and it tastes so yumm.. and asusual ur pictures are gorgeous dear. I neeed to start cooking with Apples.. havent been bold to try. Wonderful idea to use green apples due to their sourness. Gorgeous pictures!! Sounds tasty, but tell me, what do you have this with? So beautiful pics Nami :),gr8 recipe too.